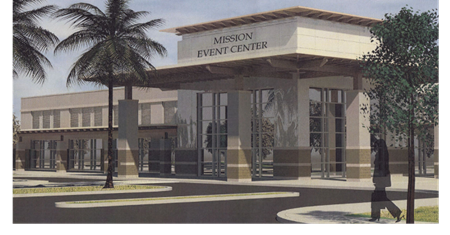 ​​​MISSION – The ​groundbreaking of the new event center will be part of an effort to bring in more revenue for the City of Mission​. The 40,000-sf facility will include an 18,000-sf ballroom, which can be broken up into seven different conference areas, a 10,000-sf lobby, and a 15,000-sf patio. The location of the new center will be located off Shary Rd. and Victoria Ave. serving as a space for city and community events as well as private parties. The event center is just one component of the project.